This Dual Band Adapter delivers powerful wireless technology to your desktop or notebook computer. 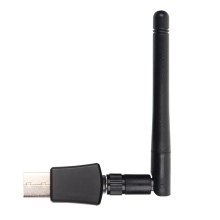 Simply plug the adapter into an available USB port and connect to a wireless network to access a secure, high-speed internet connection – 2.4GHz (150Mbps) or 5GHz (up to 433Mbps). System:Win10/8.1/8/7/xp/vista, 32/64bits, MAC IOS, Linux. Supports 802.11ac standard- The next generation of Wi-Fi. Backward compatible with 802.11 a/b/g/n products. Ultra-fast AC600 (433+150Mbps) wireless speed with 802.11ac. Maximum speed up to 5GHz 433Mbps or 2.4GHz 150Mbps. Supports Windows 10/8/7/XP 32/64bit, MAC OS, Linux.